A lot of us use bleach for disinfecting, and it is widely known to be one of the best tools for disinfecting available, but are we doing it right? How much should we use? You could be wasting a lot of bleach or the opposite – not using enough. A 1:10–1:100 dilution of 5.25%–6.15% sodium hypochlorite (i.e., household bleach) 22, 228, 553, 554 or an EPA-registered tuberculocidal disinfectant 17has been recommended for decontaminating blood spills. For small spills of blood (i.e., drops of blood) on noncritical surfaces, the area can be disinfected with a 1:100 dilution of 5.25%-6.15% sodium hypochlorite or an EPA-registered tuberculocidal disinfectant. Because hypochlorites and other germicides are substantially inactivated in the presence of blood 63, 548, 555, 556, large spills of blood require that the surface be cleaned before an EPA-registered disinfectant or a 1:10 (final concentration) solution of household bleach is applied 557. If a sharps injury is possible, the surface initially should be decontaminated 69, 318, then cleaned and disinfected (1:10 final concentration) 63. Extreme care always should be taken to prevent percutaneous injury. At least 500 ppm available chlorine for 10 minutes is recommended for decontaminating CPR training manikins 558. Full-strength bleach has been recommended for self-disinfection of needles and syringes used for illicit-drug injection when needle-exchange programs are not available. The difference in the recommended concentrations of bleach reflects the difficulty of cleaning the interior of needles and syringes and the use of needles and syringes for parenteral injection 559. Clinicians should not alter their use of chlorine on environmental surfaces on the basis of testing methodologies that do not simulate actual disinfection practices 560, 561. Other uses in healthcare include as an irrigating agent in endodontic treatment 562 and as a disinfectant for manikins, laundry, dental appliances, hydrotherapy tanks 23, 41, regulated medical waste before disposal 328, and the water distribution system in hemodialysis centers and hemodialysis machines 563. So let’s break down these dilution strength ratios in an easy to understand fashion. We’ll also use our Pure Bright Sanitizing Bleach as an example (a 5.25% sodium hypochlorite solution), because the bleach solution range they mention in the article is 5.35%-6.15%. The CDC recommendation in the article quoted above is for a dilution strength of 1:10 – 1:100 for decontaminating blood spills. 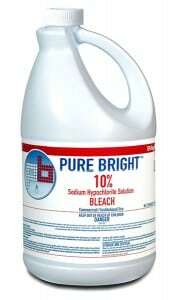 So a strong dilution strength would be one gallon of bleach for every 10 gallons of water. That’s a lot more than what most people would use since not many people have 10 gallon containers laying around, so let’s look at this dilution strength in ounces. A gallon is 128 fluid ounces. So a 1:10 dilution ratio would mean that you should mix 12.8 ounces of bleach with 128 ounces of water. For the weakest solution recommended in the CDC article (1:100), you would dilute 1.28 ounces of bleach with one gallon of water. Note that the article also mentions the importance of cleaning up the surface prior to decontamination also. It’s important to read the rest of the CDC article mentioned above for more specific information on cleaning and disinfecting, because it goes into much greater depth on the subject. It even covers disinfecting with other products like alcohol, and gives some recommendations on dilution strength for different jobs. This entry was posted in Disinfectants, FAQ's, Laundry and tagged bleach, Chlorine dry bleach, Pure Bright Bleach 10%, Pure Bright Sanitizing Bleach 5.25%, Top Job Laundry Bleach 2.75%. Bookmark the permalink. 4 Responses to How Much Bleach Should Be Used for Disinfecting? How long can a 50lb. container be stored without loosing potency? Sorry for the late reply. Since this comment was on our disinfecting article, I’m assuming that you are asking about our 50 lbs pails of Chlorine Dry Bleach? These powders are very stable and have an indefinite shelf life. The biggest threat is humidity, which would cause it to clump up. The pails are very sturdy and air-tight as long as they are not broken or mishandled in some way.